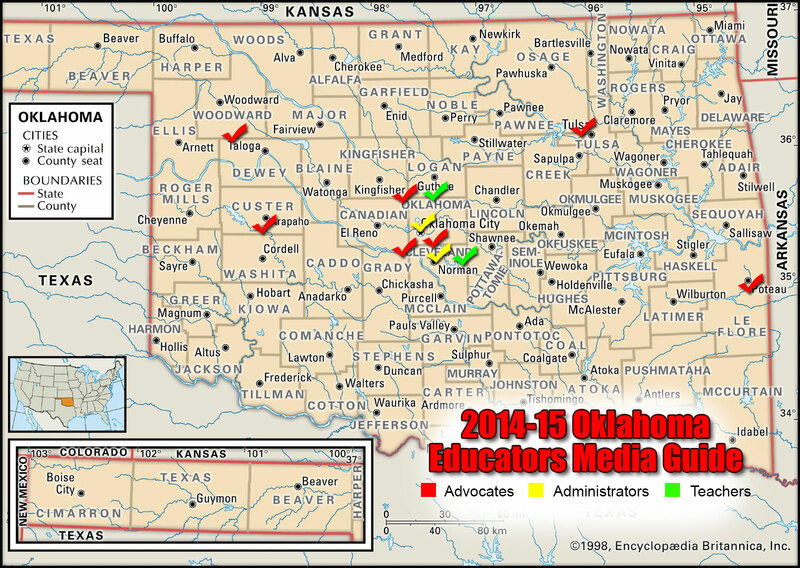 Educators from across the state of Oklahoma are currently represented in our 2014-15 Oklahoma Educators Media Guide. 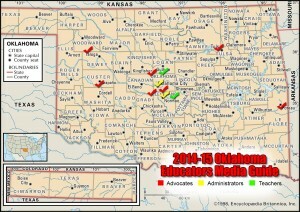 As you can see on the map above, most of them are from the Oklahoma City metro area. I’d like to see more educators from the four corners of our state represented on our map — including more classroom teachers. Teachers are the people in the trenches, the people who implement government mandates, who contend with resource shortages, and who care for our state’s most precious resource, our children. We need your voices in the press, not just the voices of corporate reformers and their followers. If you are, or know someone who is, willing and able to talk to reporters, help educate reporters about the true impact of current educational policies in Oklahoma, please send them a link to join the media guide.